Figure 1. 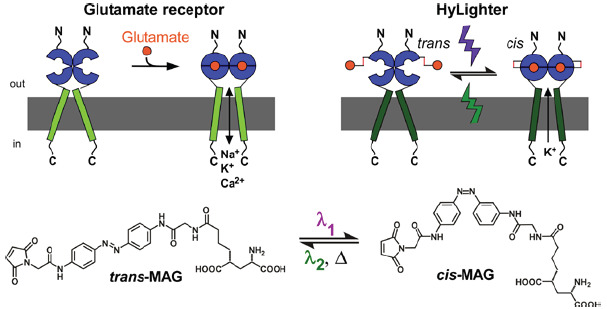 An ionotropic glutamate receptor (top left) and a synthetic photoswitch called Maleimide-Azobenzene- Glutamate (MAG; bottom) is the basis for the light-controlled HyLighter ion channel (right). Images courtesy of Dr. Harald Janovjak. Scientists can learn about the functions of specific neurons in networks, like the brain using proteins that bind natural or synthetic photoswitches. Light can turn these photoswitches on and off, allowing the control of activity in specific cells and thus observation of how processing and behavior are altered by defined neuronal populations. Processes happen fast in neurons, so speed can be critical for some studies. The bacteriorhodopsin and HaloR families are the only lightactivated inhibitory proteins with millisecond resolution. However, they aren't without room for improvement. Both require continuous illumination to stay activated, and continuous light can cause problems such as rebound excitation or eventual partial inactivation. Also, HaloR can require high light intensities because the magnitude of the current is driven by the constant activation of the pumping cycle. Thus researchers led by Ehud Y. Isacoff from the University of California, Berkeley and the Lawrence Berkeley National Laboratory designed a ligand-gated ion channel that is K+ selective and controlled with light. Called HyLighter, the ion-channel isn’t active until exposed to light, is more sensitive to light than HaloR, and can reach its maximum current over a wide range of light intensities. The light-activated ion channel can convert a light pulse into a stable hyperpolarizing current that stays on with no illumination until it is turned off using a complementary wavelength. It is based on an ionotropic glutamate receptor (iGluR). 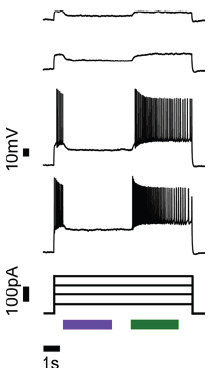 These cation channels mediate excitatory neurotransmission in higher organisms and are permeant to Na+ and K+. Figure 2. MIP image of overlayed confocal stacks HyLighter:GFP with non-specific tdTomatoe. 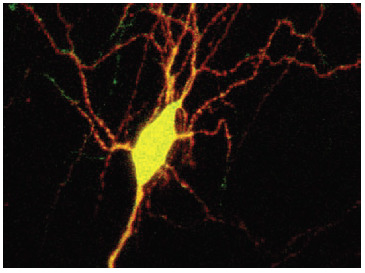 Note the cell shows widespread (yellow) presence of HyLighter GFP, which can be used to silence the neuron when pulse illuminated with 390nm. Pulse illumination at 500nm inactivates the K+ channel. To create HyLighter, the researchers first engineered chimeric iGluRs with the ligand-binding domain of iGluR6, the photoswitched tethered ligand attachment site that encodes light sensitivity in the excitatory LiGluR channel, and the pore of sGluR0, an exotic bacterial iGluR homologue. They experimented with the various chimeras they created and found that one had all the characteristics they needed. It functioned as a light-gated K+ channel, was maximally activated by low light intensity at wavelengths ~390 nm, maintained activity in the dark, and could be turned off with 500 nm light. They tested HyLighter by transfecting cultured hippocampal slices from early postnatal rats with HyLighter-GFP using biolistic gene transfer. It was expressed well in all regions of the hippocampus and homogenously distributed in all parts of the neuron. They activated HyLighter with 390 nm illumination from a Lambda DG-4 light source coupled to the microscope and projected onto the sample through the Mosaic DMD through a 40X objective. Figure 3. Action potentials triggered by current injections are robustly silenced when HyLighter is activated by 390 nm light (violet bar) and no longer inhibited when deactivated with 500 nm light (green bar). "Among the existing microscopy solutions, only the Mosaic allows you to continuously illuminate an arbitrary mask in the imaging field. You simply can't do this using laser-scanning microscopes, which never provide true simultaneous illumination. This important feature combined with ease of use and direct interfacing with software makes the Mosaic a unique and valuable tool for the optogenetic community," said Dr. Harald Janovjak, who was part of the research team and is now at the Institute of Science and Technology Austria (IST Austria). In the hippocampal slices, HyLighter induced strong hyperpolarization that could silence neuron firing until deactivated by 500 nm light. At the sample, the light intensity was approximately 20 mW mm-2 at 390 nm and 40 mW mm-2 at 500 nm. The researchers also generated transgenic zebrafish expressing HyLighter. When the tails of these fish received 390 nm, the probability of an escape response after a mechanical stimulus was reduced. This was reversed by 500 nm illumination. The illumination had no effect on escape responses in zebrafish not expressing HyLighter. The researchers look forward to HyLighter emerging as an important tool for the optogenetic control of neuronal activity. "When it comes to silencing of nerves cells, bi-stability and the requirement for small amounts of light make HyLighter unique," said Dr. Janovjak.